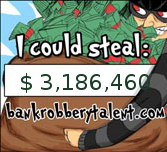 Now robbing a bank is risky right? Why not find the chances of you ending up in prison then? You can do that on the Are You Going to Prison? quiz. (I have 7% of chances of ending behind the bars). Finally, we have some vocabulary, spelling and grammar quizzes on Daily Writing Tips. On those you might at least learn something! I love quizzes, trivia, and anything of the like.